What the Bible says about Abortion! Read the story about the baby holding the surgeons finger from within the womb during fetal operation. Academically, the issue of abortion involves the balance of rights and freedoms between the mother and the baby. At what point does life (ie: do not kill) begin between conception and birth? Is it sin to abort a fetus? A. If these are valid before birth, why not after birth too? This is a red herring it never happens! should child suffer for sin of another? A. Now where uses phrases "human" or "human being"
Uses "man, woman, child, son, daughter, baby etc." The Bible makes no distinction of any kind in the terms used to describe a fetus. notice the difference: day of birth, night conceived see Rev 12:5 "man child born"
Literal translation: "Child brought forth"
Woman to man, "Why yes, I do use an oral birth control method...the word no!" I. Is The Life In The Womb A Human Individual? The fundamental question to be answered is whether or not the life that has been conceived in the mother's womb is a human person, separate and distinct as an individual from the mother. God created only three basic classes of life, each of which reproduces after its own kind: plants, animals, and people. (Gen. 1:11,12,20-25,26-30; 5:1-4). In which of these three categories should a living, unborn baby be classed? It cannot be considered plant or animal because plants and animals reproduce after their own kind. It is the result of human reproduction, and humans are distinct from the plants and animals. Therefore the life in the womb of a human mother must necessarily be human! We next ask: is the life in the womb just a part of the mother's body (like an appendix, so removing it is not murder), or is it a separate and distinct individual from the mother so that killing it is murder? This is the issue we must resolve. The Bible (King James Version and most other versions) nowhere uses the phrases "human" or "human being" to refer to anyone, so we cannot determine whether the unborn is a human individual simply by searching for the terms "human being." Instead, the Bible identifies a human person by calling it simply a "man," "woman," "child," "son," "daughter," "baby," "infant," etc. What we need to know, then, is whether or not the Bible refers to the unborn baby by terms that imply humanity, just as it does for other humans. Gen. 25:21,22 In Genesis 25:21,22, Rebekah conceived twins, and "the children struggled together within her." That which was conceived was called a "child" between the conception and the birth. On the very night of Job's conception it could have been said, "There is a man-child conceived." The word for "man-child" (Heb. GEBER) elsewhere means "man," i.e., a human individual (see Job 3:23; 4:17; 10:5; Psalms 127:5; 128:4; etc.). Job 3:16 Babies that die before birth are called "infants" that never saw light. This is exactly like babies that are aborted. This word (Heb. OLEL) always and without exception refers to human individuals (cf. Hosea 13:16; Psalm 8:2; Joel 2:16). Numbers 12:12; Luke 1:43 In Numbers 12:12, Moses describes "one dead, of whom the flesh is half consumed when he cometh out of his mother's womb." If a baby dies before it is born -- as in an abortion -- the woman who conceived it is still a "mother." In Luke 1:43, Elizabeth addressed Mary as "the mother of my Lord" before Jesus was born. The word "mother" (Heb. EM; Greek METER), in contexts referring to physical human reproduction, always refers to one who has procreated or formed another human individual, a separate and distinct individual from the mother herself (see Num. 6:7; Gen. 3:20; Luke 1:60). A woman who has conceived, even if the child is not yet born and even if it dies before birth, is a "mother." That which has been conceived and lives in the mother's womb from conception on is referred to by God as a "child," a "son," an "infant," a "baby," a "man-child," etc. The woman in whose womb it lives is a "mother." No human being anywhere in the Bible is identified by terms that are more distinctly human than these terms. 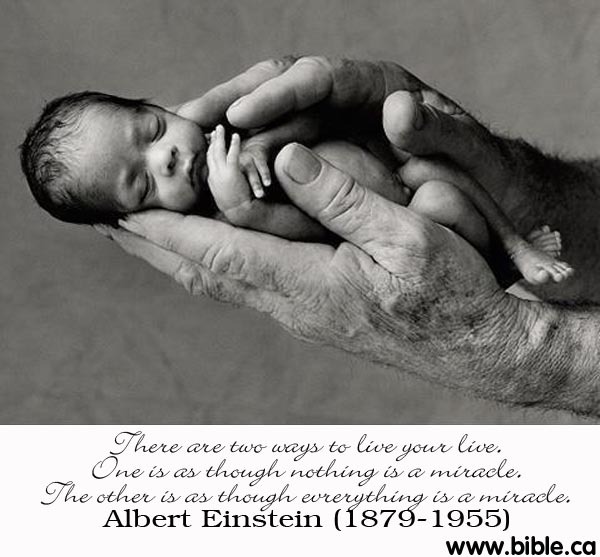 God makes no distinction between born and unborn life. He uses exactly the same terms for both, therefore we should view them as having the same nature. Remember that we established from the beginning that the life in the mother's womb is human life. The only question to be settled was whether it is a distinct individual from its mother or just part of the mother's body. Consider the force of the evidence we have now examined: Does the Bible refer to parts of the mother's body as "child," "son," "baby," etc.? Clearly not. Nor is a woman ever called a "mother" just because she has these body parts. Why is this so? Because the terms "child," "son," "baby," etc., are terms that imply a separate human individual, not just a part of the mother's body. Consider the parallel to the Godhead. We can prove that God the Father and Jesus are two separate individuals by referring to the many passages that mention Jesus as the Son of God the Father. A person cannot be his own father or his own son. A father and his son make two separate individuals (cf. John 8:16-18). Likewise, when a woman has conceived, the life in her womb is her "son" (or "daughter") and she is its "mother." If God the Father is a separate individual from Jesus Christ His Son, then in the very same way and for the very same reasons a mother must be a separate individual from the son or daughter in her womb. II. HOW SHOULD WE TREAT AN UNBORN CHILD? The unborn life in the mother's womb is a human individual from conception on. How should we treat this unborn life, and may we deliberately kill it? Surely we must be guided by exactly the same rules or principles we should follow in our treatment of any other "child" or "baby." What are these rules? Abortion's defenders often argue that, if the mother does not "want" to have the child, she may abort it. But does a mother have the right to not want her child? Psalm 127:3-5; 128:3-5 -- Children are a blessing, a source of happiness and joy to their parents. Yet unborn babies are children, so parents ought to appreciate them as a blessing from God. People who have Scriptural attitudes will never kill unborn babies because they will never want to. Abortion is the grossest form of ingratitude for God's blessing. Proverbs 22:6; Ephesians 6:4 -- God has made us stewards of our children. A steward is a person who has been entrusted with something that belongs to someone else. He is responsible to care for that item and use it to accomplish the purpose of the one to whom it belongs. He will be condemned and punished by the owner or master if he abuses or misuses that which has been entrusted to him (Luke 12:42-46; Matt. 25:14-30; I Cor. 4:2). An unborn child is a particular blessing that has been given into our care just as surely as is a child that has been born. We have the same God-given duty toward an unborn child as we do toward one that has been born. If we kill them, we defeat God's purpose for their lives. How can we "train up" and "bring up" those whom we have killed?! Abortion is the grossest form of child abuse and the most extreme perversion of parental responsibility. God will not fail to hold us accountable. B. God Says to Love Our Children. Titus 2:4 -- Young women should be taught to love their children. But an unborn baby is a "child," and a woman who has conceived is a mother even before the baby is born. The Bible tells us how we should act toward those we love (I Cor. 13:4-7), and this teaching definitely does not allow us to kill them (Rom. 13:8-10). We have clearly established that abortion is wrong without even (thus far) examining passages specifically dealing with murder. Abortion does fit the Bible definition of murder. But even if it did not, it would still be sinful because it is unloving, a lack of appreciation for God's blessings, and a gross abuse of our stewardship to raise our children as God directs. C. Respect for Life: Do Not Kill an Innocent Child. Revelation 21:8; 22:15; Matthew 15:19,20; and Romans 13:8-10. 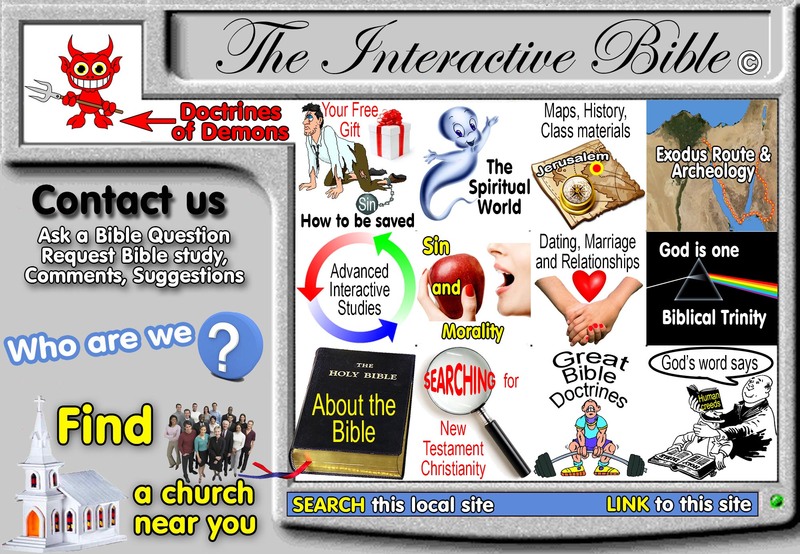 In addition, please consider these specific passages. Psa. 106:37,38 -- Israel was polluted with blood because the people shed the innocent blood of their "sons and daughters." But unborn babies are "sons and daughters." What then is the condition of our land when over 25 million "sons and daughters" have been legally killed? Matthew 2:16 -- Herod is considered wicked because he slew the male children in Bethlehem. Luke 2:12,16 calls such children "babes." But Luke 1:41,44 also calls unborn children "babes," so how can it be acceptable to kill them? Hosea 13:16; 2 Kings 8:12 -- When children or infants are dashed to pieces, it is a great tragedy to any nation. Yet unborn babies are children or infants, and in our nation they are dashed to pieces by the millions! Acts 7:19; Ex. 1:16-18 -- Pharaoh commanded that Israelite "sons" or "men children" be killed as soon as they were born. But these same terms are used for unborn babies. Would it have been acceptable for Pharaoh to have had abortions performed to kill the babies? Is it any less wicked if people today do it? Deuteronomy 27:25 -- "Cursed be he that taketh a bribe to slay an innocent person." What clearer description could be given for people who operate abortion clinics? Abortion is wrong, therefore, because it is a failure to love, appreciate, and care for a human baby. It is also wrong because it constitutes the deliberate killing of an innocent human being. When people defend abortion, their arguments should always be evaluated in light of the fact that the unborn baby is a human being, a separate individual from its mother. Therefore, deliberately killing it would be just as wrong as killing any other innocent human being. What should a woman do if she has aborted a baby and now realizes she did wrong? She does not need to spend the rest of her life with the burden of unforgiven guilt. The Bible says abortion is wrong, but it also offers a source of true forgiveness through the blood of Jesus Christ. God will forgive if we will come to Him according to His conditions. Read and obey these passages: Rom. 1:16; 6:3,4; 10:9,10; Mark 16:16; Acts 17:30; 2:38; 22:16. Here is the story about the baby holding the surgeons finger from within the womb during fetal operation. Your first instinct is to recoil in horror. It looks like a close-up of some terrible accident. And then you notice, in the centre of the photograph, the tiny hand clutching a surgeon's finger. The baby is literally hanging on for life. For this is one of the most remarkable photographs taken in medicine and a record of one of the world's most extraordinary operations. It shows a 21-week-old foetus in its mother's womb, about to undergo a spine operation designed to save it from serious brain damage. The surgery was carried out entirely through the tiny slit visible in the wall of the womb and the `patient' is believed to be the youngest to undergo it. At that age the mother could have chosen to have the foetus aborted. Her decision not to, however, led to an astonishing test not just of medical technology, but of faith. Samuel Armas has spina bifida, which left part of his spinal cord exposed after the backbone failed to develop. The operation was designed to close the gap and protect the cord, the body's motorway for nerve signals to the brain. So, on an unborn patient no bigger than a guinea-pig, the operation was performed without removing the foetus from the womb. The instruments had to be specially designed to work in miniature. The sutures used to close the incisions were less than the thickness of a human hair. An ER-style crash-cart team was on constant standby in an adjoining room. When it was completed, however, Samuel's battle for survival was only just beginning. Nor would the emotional battle his parents had already endured finish quite yet. Julie and Alex Armas had been trying desperately for a baby. Julie, a 27-year-old nurse, had suffered two miscarriages before she became pregnant with the child they intended to call Samuel Alexander if it was a boy. Then, at 14 weeks, she started to suffer terrible cramp. An ultrasound scan was carried out to show the shape of the developing foetus and its position in the womb. When the picture emerged, it was the moment that every parent-to-be dreads. Their unborn son's brain was mis-shapen and his spinal cord was sticking out from a deformed backbone. He had spina bifida. They were devastated and ``torn apart'' said Alex, a 28-year-old jet aircraft engineer. At that stage, and even weeks later, the couple could have decided to have the pregnancy terminated. In their home town of Georgia in the US as in Britain abortion is routinely offered. Although accurate figures are not available, many parents accept. For Julie and Alex, who are deeply religious, it was not an option. That didn't mean, of course, that they were not racked by pain at the thought that the child they had longed for was imperfect. It also riddled them with guilt over whether they had effectively taken the decision to inflict their son with years of handicap, pain and suffering. So, this being the United States, they turned to the internet for help. Julie's mother found a website giving details of pioneering surgery being carried out by a team at Vanderbilt University in Nashville, Tennessee. Although the results have not yet been endorsed in medical journals, they looked encouraging to Mr. And Mrs. Armas. Their doctor put them in touch with Dr. Joseph Bruner (it is his finger in the photograph). A race against time had begun. Because it affects the spinal cord, spina bifida can lead to a condition that causes brain damage. Mr and Mrs. Armas were told that if they were to avoid the condition, which was not then present in Samuel, they had to act fast. The theory behind the surgery is that attention to he spine disorder before the baby is born prevents or limits brain damage, and gives a better chance of healing. It does not cure spina bifida, but it is said to provide a strong chance of limiting the damage through early intervention. The risks, however, are enormous. Controversy surrounds the use of such surgery because it goes against the general medical rule that the risk should not outweigh the benefit. Mr and Mrs Armas were fully aware that if anything went wrong, no attempt would be made to deliver Samuel by Caesarean section. 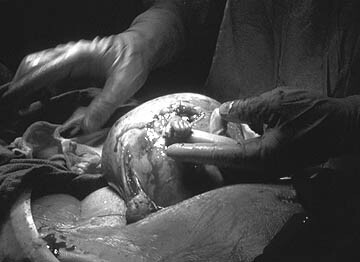 Medical science does not yet have the capability to keep a 21-week-old foetus alive outside the womb. The crash-cart was on standby for Julie, not Samuel. The other major dangers were turning him in the womb to get his back in line with an inch-long cut in the wall, through which Dr Bruner would operate, and that the surgery might involve releasing the fluid around Samuel. The movement posed the risk of sending Julie into labour contractions, which would have been fatal for Samuel. Robert Davis, who reported on the operation for USA Today newspaper, said the lesion that exposed Samuel's spine was found low on his backbone, decreasing the chance of nerve damage. Although Samuel is believed to have been the youngest patient for such an operation, it was apparently routine enough for Dr Bruner and paediatric neurosurgeon Noel Tullpant to talk about the weather during the operation. An hour later, the womb is gently eased back into place. ``Beautiful,'' said one of the technicians and relief swept the room. Julie was allowed home with Alex within days. The baby is due on December 28. He has not yet felt the touch of his mother's skin against his own and he knows nothing of life outside her womb. But perhaps Samuel Alexander Armas will be able to shake Dr Bruner's hand again. By Justine McCarthyNobody could be unmoved by the powerful image of this tiny finger clinging to the surgeon's hand. A hand that can create modern miracles and save lives that might otherwise be doomed before they even begin. This picture is an emotive and compelling argument against the termination of abnormal pregnancies and it appears as Ireland braces itself for yet another visitation of the debate. As the range of options outlined in the government Green Paper are being considered for the next instalment in the Irish debate, there is a sense of an uneasy calm before the storm. With assisted abortion technically legal here under the Supreme Court ruling in the X Case, pro-life organisations still continue to lobby for yet another referendum on the substantive issue. Dana's election to the European parliament last summer was indicative of the strong pro-life undercurrent in her constituency of Connacht-Ulster. Suggestions that similar candidates might be fielded throughout the country at the next general election are predicated on the belief that a referendum is still a possibility. In fact, Dana indirectly raised the subject in Europe this week when she put down an amendment to the Union's budget seeking to end the funding monopoly enjoyed by the European Women's Lobby. She wanted to give some of the allocated £480,000 to the World Movement of Mothers, an organisation Dana claimed to know little about but which others described as pro-life. The European Women's Lobby, an umbrella organisation that lobbies the EU on behalf of various womens groups throughout the Union, claimed that the proposed cut in its funding could jeopardise the jobs of its 10-strong staff. Though, ultimately, no vote was taken on that amendment, it focussed the parliament's minds on the issue of abortion once again. Nearly 6,000 Irish females are expected to travel to Britain this year for abortions. In this country, however, the debate has traditionally been concerned with crisis pregnancies rather than abnormal foetal development. In that respect, this extraordinary photograph may have more relevance to the debate in Britain where termination is legally available at 21 weeks - the age of the world's youngest known patient.